How to handle a dropped third strike should be in “Catcher Training 101” but we often are so concerned about teaching other skills we ignore the elephant sitting in the room. All catchers, little league to pro, will drop a third strike from time to time, or the pitch will hit the ground before it can be caught. This in itself is no big deal if the catcher knows how to handle the situation, and of course that’s exactly what I’m going to teach you. The very first thing to remember is “Don’t Panic!” This is a natural emotion which produces uncoordinated foot work, jabbing at the ball instead of gripping it and fumbling of the ball with a poor grip which results in a bad throw to first. Control your emotions … you know how to handle the situation … move quickly, purposely and simply execute it. When there is a called third strike, or a swinging third strike which is muffed, but the ball falls within your reach, pick the ball up and tag the batter out. Most of the time the batter will not be running, but rather will be standing at the plate disappointed he struck out and within easy reach. If the runner has begun to run to first base and you believe you can easily catch him, chase and tag him out. When you tag him don’t slam the mitt against him, as that could cause the ball to pop out of the mitt. Simply tag him by touching the mitt against him. A word of caution here … when tagging you must have the ball in the hand you tag the runner with. Tagging with the mitt and holding the ball in your bare hand is Not an out. 99% of the time if you can not catch and tag the batter out within 3 to 4 steps he’s faster than you are. Do not continue to chase him, but rather step to one side or the other of the runner, giving you a clear line of vision and throwing lane, and throw the ball to the first baseman for the out. Should the ball bounce out in front of the plate into fair territory, staying low come out from behind the plate and secure the ball. If you are far enough into the field to obtain a clear path of vision and throwing lane to your first baseman, set and throw. If not, take a step or two farther into the field to create a clear path, then throw. The ball kicks away to your right and remains in foul territory. Turn to your right and staying low, secure the ball. Raise, set and throw to first. Again, be sure you have a clear path to the first baseman. If the ball careens into foul territory to your left, turning left and staying low, secure the ball, insure your clear throwing lane by moving to your left if necessary and throw. There will be times there will be a runner on second or third base when the third strike is muffed, which creates a much more difficult situation for the catcher. You don’t want the strike out to become a productive time at bat by moving the runner over a base or worse yet, scoring. Therefore your sequence of actions change a bit. 1. The first thing to do is locate the baseball. You can’t do anything without the ball, so locate and secure the ball. 2. The next step is determined by your experience and capabilities and is a split second decision. How far away did the ball bounce? If the ball rolls 15-20 feet away from you, your first instinct should be getting 1 out. 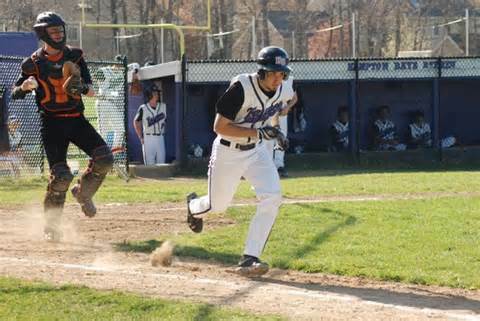 As you chase the ball glance at the runner on second to see if he’s running, but do not look at him and lose track of the ball. If he’s running chances are you will not be able to throw him out at third, so be sure to get the out at first base. If he is not running, when you secure the ball locate him, look him back to second base, then throw to first for the out. Caution … You can’t take too long to do this as the batter is running to first base. 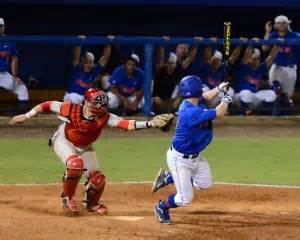 Don’t let the runner on second make you hesitate too long by juking back and forth and allow the batter to be safe. It’s better to get the out and allow the runner to advance than to put two men on base. 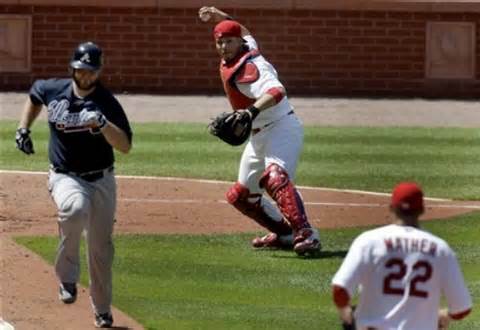 A Cardinal rule in baseball is always attempt to prevent big innings. It’s better to allow 2 runs to score than fruitlessly throwing the ball all around the field and end up allowing 7 runs to score. Again experience is a large factor. As always, attempt to smother the ball keeping it from rolling too far away. If the ball is within easy reach, secure the ball, look the runner back to third while moving into throwing position, then throw to first for the out. You notice I said move while looking the runner back. Experience will tell you if the ball is a few feet in front of or to either side of the plate, you will need to move in order to clear you a vision and throwing path. (1) We’ve talked about analyzing and knowing your playing environment and this is another example. Know your backstop. How far back is it? If it’s located close to the plate, a ball which careens past you may still be playable. Is it cushioned which would deaden the ball and require you to go get it? Is it brick which would make the ball bounce back to you? (2) Never throw a ball over the runner’s head to the fielder because it’s hidden from the fielder until it clears the player, which could easily result in him missing it and creating an error. That’s why it’s imperative to always obtain a clear throwing lane. (3) The first baseman and catcher should react as one when throwing and receiving the throw. If the runner is running in foul territory both players should move to the infield side of the base and runner. Running in fair territory … move into the foul side of first base. A muffed 3rd strike, whether by the catcher or the pitcher, is a fact of baseball life no different than a ball lost in the sun. The key is to know how to handle the situation, train and execute.